This workout includes a tiebreak. If all 165 reps are completed prior to the 9-minute time cap, your score will be your total time, and there will be no tiebreaker. However, if you are not able to complete the entire workout in the allotted time, a tiebreaker will be factored into your final score. During the workout, be sure to note your time at the end of each set of deadlifts. 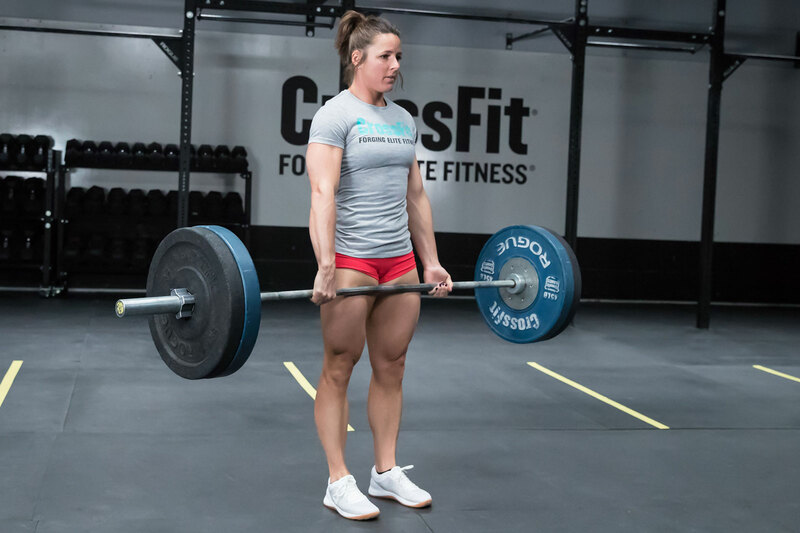 When you submit your score, there will be a space for your final rep count and an additional field for you to enter the elapsed time at which you completed your last full set of deadlifts. In the case where two athletes have the same score (total number of reps), the athlete with the lower tiebreak time will be ranked higher. *The official weight is in pounds. For your convenience, the minimum acceptable weights in kilograms for the deadlift are 143 kg (315 lb. ), 115 kg (255 lb. ), 102 kg (225 lb. ), 93 kg (205 lb. ), 83 kg (185 lb. ), 75 kg (165 lb. ), 70 kg (155 lb. ), 61 kg (135 lb. ), 56 kg (125 lb. ), 52 kg (115 lb. ), 47 kg (105 lb. ), 43 kg (95 lb. ), 36 kg (80 lb. ), 34 kg (75 lb.) 29 kg (65 lb. ), and 25 kg (55 lb.). Prior to starting, film the plates and barbell to be used so the loads can be seen clearly. 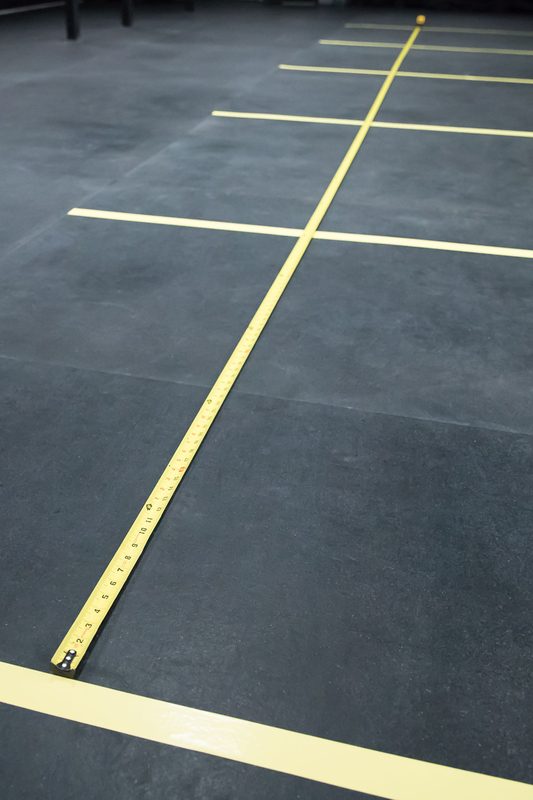 Also film the measuring process for the handstand push-up mark and the length of the floor marks for the handstand walk so all measurements can be seen clearly. All video submissions should be uncut and unedited in order to accurately display the performance. A clock or timer with the running workout time clearly visible should be in the frame throughout the entire workout. Shoot the video from an angle so all exercises can be clearly seen meeting the movement standards. Videos shot with a fisheye lens or similar lens may be rejected due to the visual distortion these lenses cause. 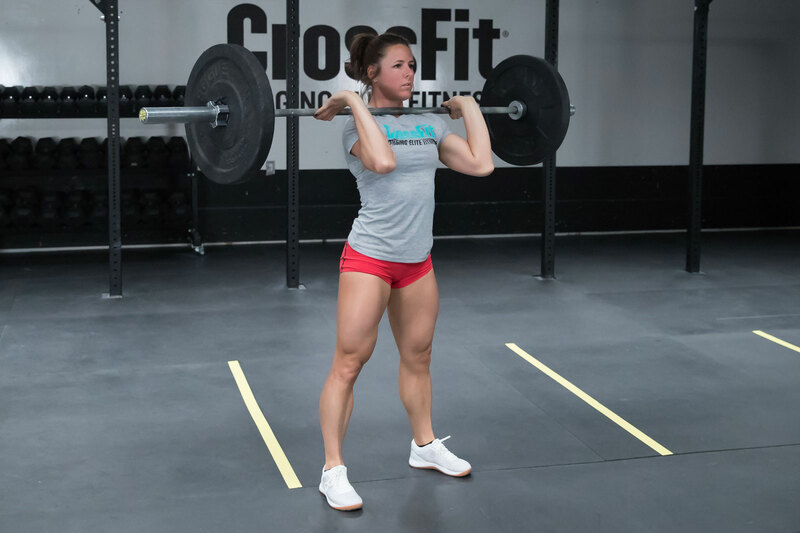 Starting with the barbell on the floor, the athlete lifts the bar until the hips and knees reach full extension, and the head and shoulders are behind the bar. The arms must be straight throughout. No bouncing. Two separate barbells may be used for deadlifting during the workout. If one barbell is used, the athlete may receive assistance with changing the load. 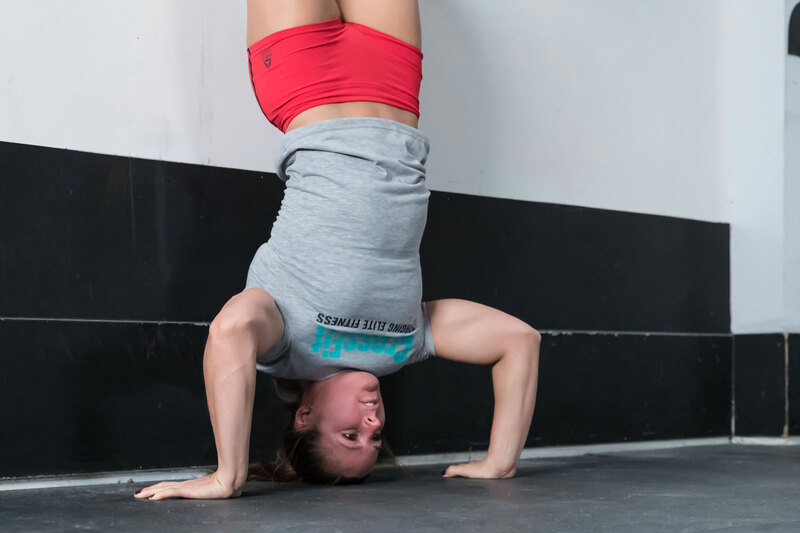 Prior to starting, the athlete will need to establish the foot line on the wall for the handstand push-up. 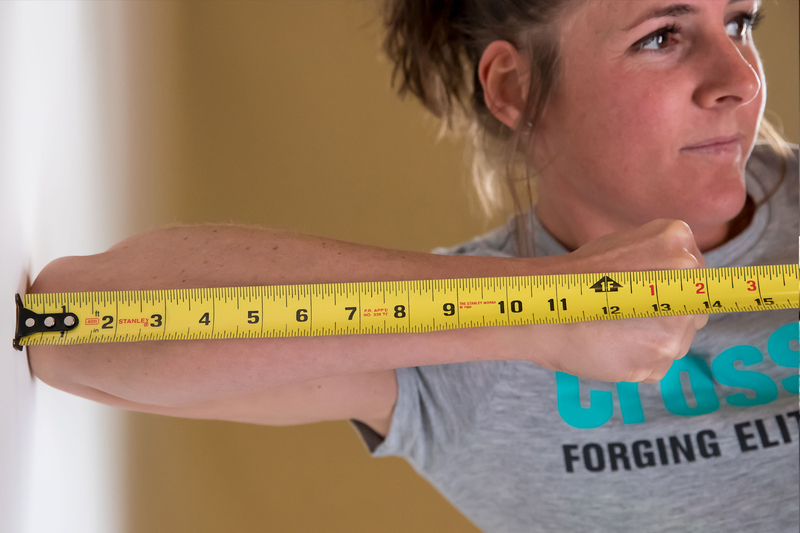 For the first step, measure the distance from the athlete’s elbow to the athlete’s middle knuckle while he or she makes a fist. In step 2, the athlete will stand with his or her back to the wall on the same surface the hands will be on, with feet at hip width and heels touching the wall. A line will need to be drawn on the wall, marking the height of the top of the athlete’s head. 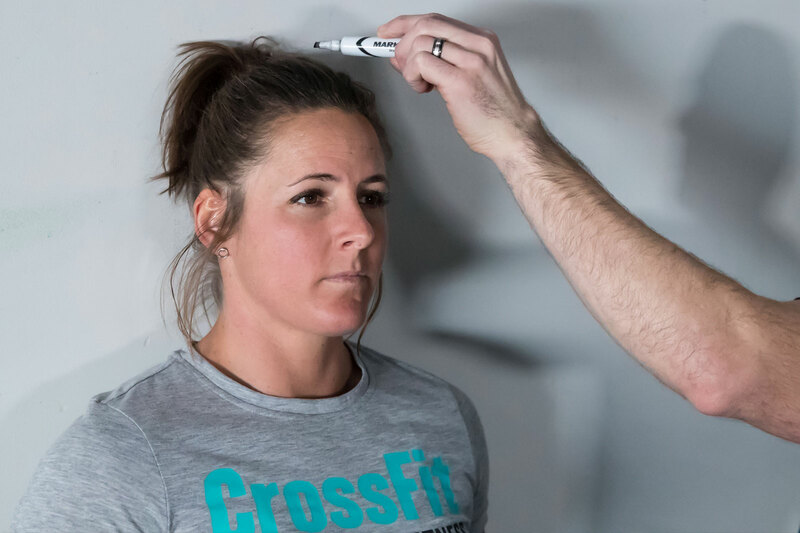 From the mark for the top of the athlete’s head (step 2), add half the distance measured in step 1 and make a second mark. This will be the height of the target line for the handstand push-ups. 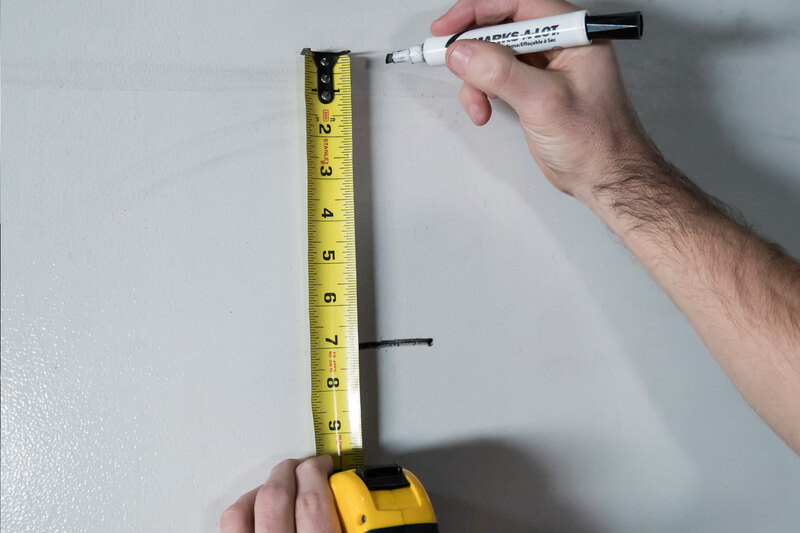 For example, if an athlete is 65 inches tall and measures 14 inches from elbow to knuckle, he or she would add 7 inches to the height mark for a final target line of 72 inches. Once the height of the target line is established, mark it with a marker, chalk or tape. Judges may restore the line between rounds as needed. 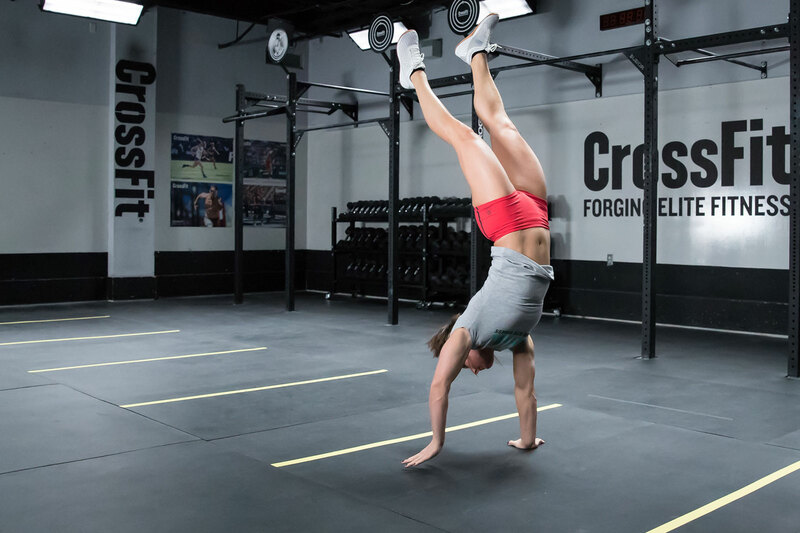 Every repetition of the handstand push-up begins and ends at the top of a handstand, with the arms fully locked out, the heels in contact with the wall, the hips open and the body in line with the arms. The athlete’s heels must start the rep above the pre-marked target line. At the bottom, the athlete’s head makes contact with the ground. If the head and hands are on different surfaces, the surfaces must be level. For example, if the hands are on plates and there is a pad under the head, the top of the pad must be level with the top of the plates. 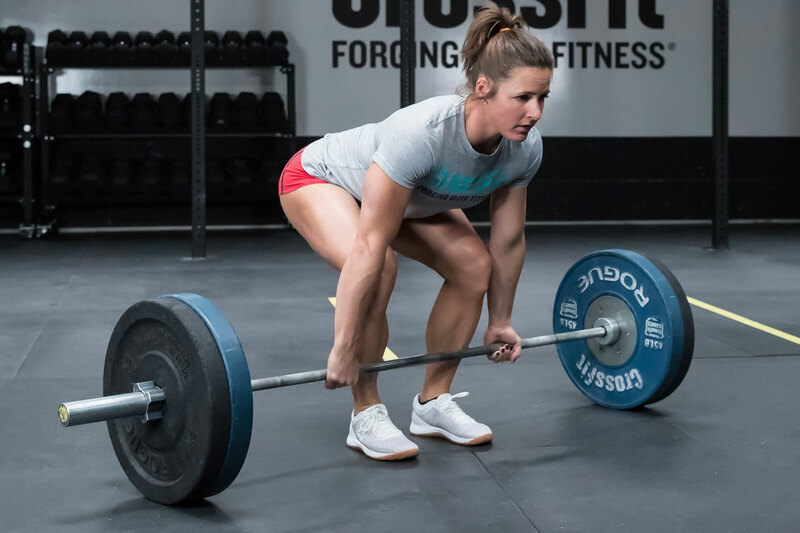 The feet do not need to remain in contact with the wall for the entire movement but must touch above the line at the beginning and end of each rep. Kipping is allowed. The handstand walk area must be divided into 5-ft. segments visibly marked on the floor. Ideally, the lane will have five consecutive segments, allowing a 25-foot walk in one direction and a 25-foot walk back. Walking more than 25 feet in one direction without turning around is not allowed. The athlete must start with feet BEHIND the mark denoting the start of the segment being attempted, and when kicking up, the hands (entire hand, including palm and fingers) must also start BEHIND the line. 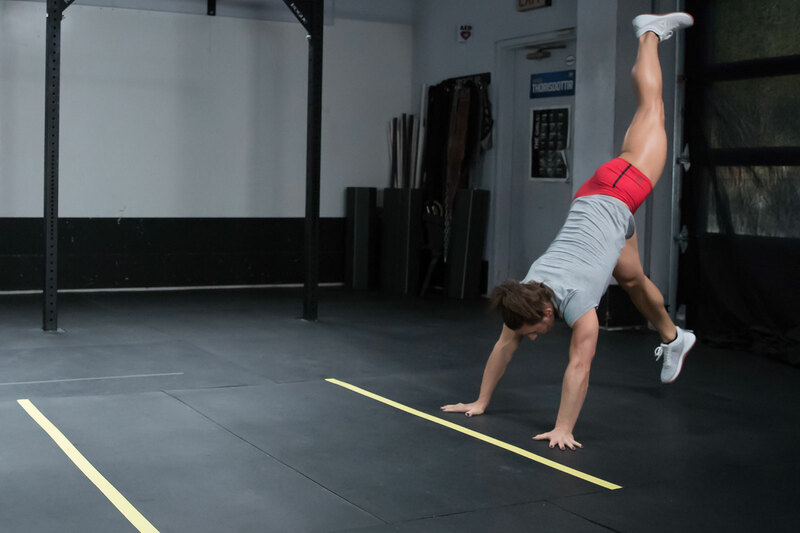 Stepping across the line or landing with the hands across the line when kicking up into the handstand constitutes a no rep. If at any time the athlete comes down from the hands, he or she must restart from the last increment crossed. 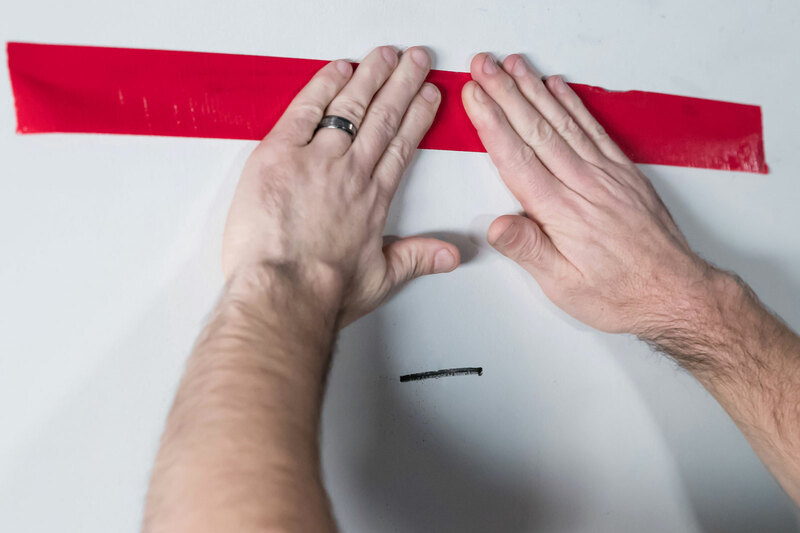 Both hands, including palms and fingers, must cross the line marking the 5-foot increment to earn credit for that distance. Each 5-foot section will count as 1 rep. The bear crawl area must be divided into 5-ft. segments visibly marked on the floor. Ideally, the lane will have five consecutive segments, allowing a 25-foot crawl in one direction and a 25-foot crawl back. Crawling more than 25 feet in one direction without turning around is not allowed. The athlete must place both hands (entire hand, including palm and fingers) on the ground BEHIND the mark denoting the start of the segment being attempted. 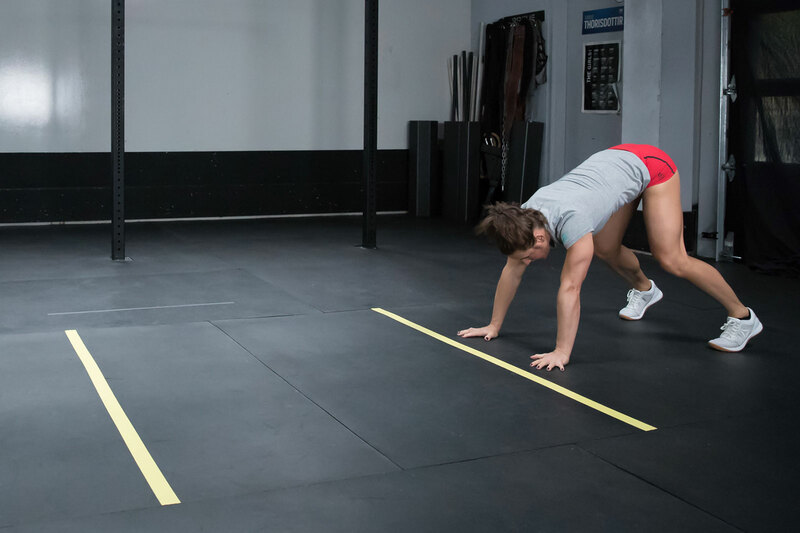 Reaching across the line and placing hands into the segment constitutes a no rep. During the bear crawl, the athlete must touch both palms to the floor and raise the hips above the height of the head so as to be supporting some body weight with the arms. If at any time the athlete stands up, drops to the floor, or drops the hips below the height of the head, he or she must restart from the last increment crossed. Both hands and both feet must cross the line marking the 5-foot increment to earn credit for that distance. 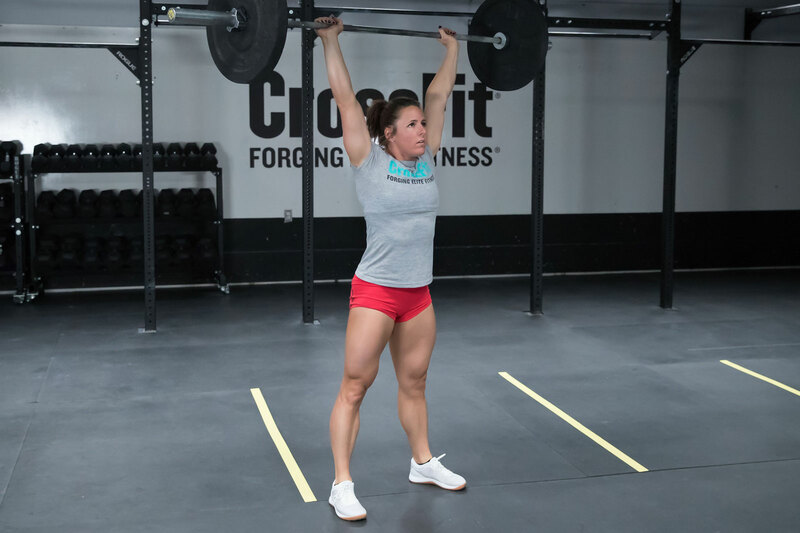 Each 5-foot section will count as 1 rep.
At the top, the arms, hips and knees are fully extended, and the bar finishes directly over the middle of the body with the feet in line under the body. Using a rack is not permitted. Athletes may have two separate barbells for the deadlifts and another barbell for the push presses. A straight body position must be maintained throughout the hand-release knee push-up. No snaking or sagging. The elbows must be locked out at the top with the knees no wider than shoulder width.